IMPORTANT: iOS 8.0.1 update has caused some users to lose cellular signals and Touch ID capabilities, and Apple has pulled it from their servers. Users are strongly advised to not install the update yet. More information about the “No Service” issues and other complaints with the update are available below. iPhone 6 and iPhone 6 Plus users can fix the “No Service” problem with these instructions. Apple has released iOS 8.0.1 (build 12A402) for all iPhone, iPad, and iPod touch devices that are capable of running iOS 8.0. The update includes multiple bug fixes and improvements to iOS, and is said to resolve some of the complaints that users have experienced recently with third party keyboards, Reachability, Safari uploading, and more. 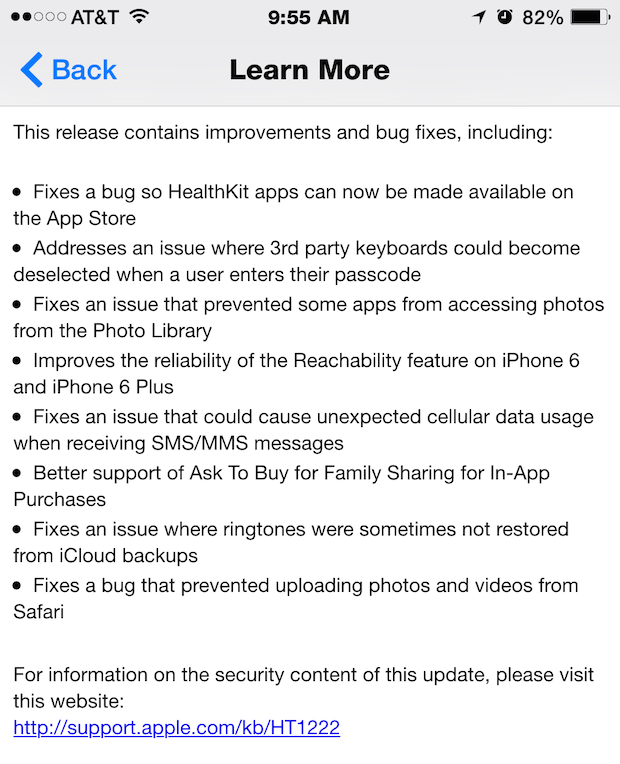 Release notes for the iOS 8.0.1 update are included below. While there is no specific mention of addressing wi-fi issues or battery life complaints, it’s possible that resolutions to those issues have been included in the update as well. 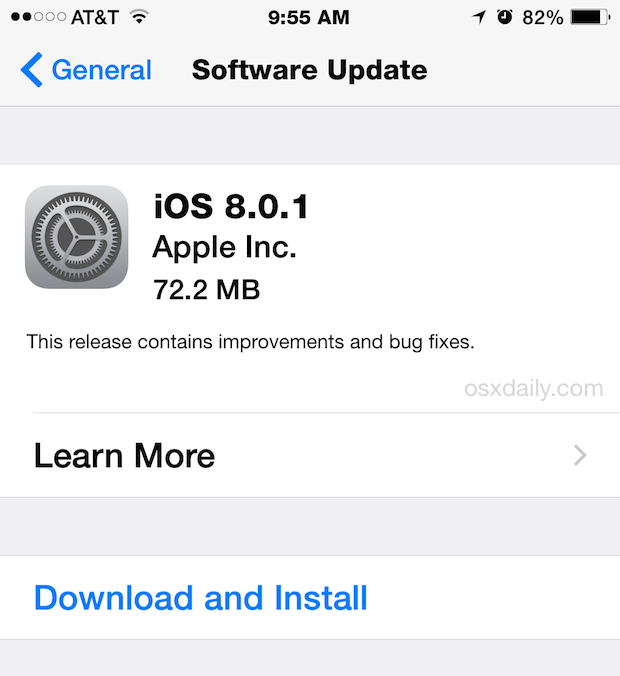 The update for iOS 8.0.1 is roughly 70MB to download and is easily installed through Over-the-Air updates directly on an iDevice. Always backup your idevice before installing any software update, even with small point releases. Things could theoretically go wrong and you’ll want to be sure you can easily recover in the event of something happening. Downloading the update is quite fast, though it may sit on “Preparing Update…” for quite some time. The iPhone, iPad, or iPod touch will eventually reboot and complete the installation. Users can also choose to install the update with iTunes. We’ll update with direct IPSW firmware download links as they become available. 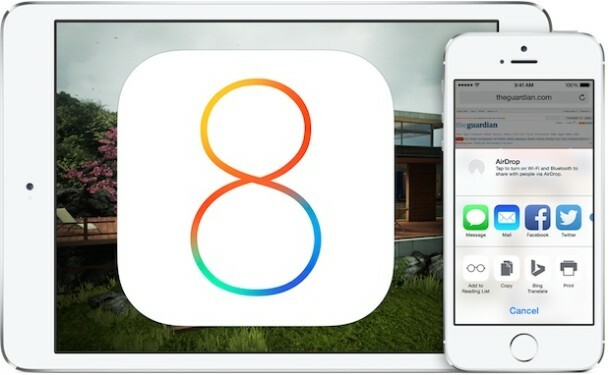 Many users who installed iOS 8.0.1 have reported problems with cellular service and cell connections, in addition to problems with Touch ID immediately after installing the update. Notably, iPhone 6 and iPhone 6 Plus users have experienced a persistent “No Service” cellular signal failure. Touch ID has reportedly stopped working for many users, though which devices are impacted by the Touch ID failure are not yet known. At the moment, it seems like iOS 8.0.1 introduces more bugs than it fixes, so users are strongly advised to avoid the update. If you already updated to iOS 8.0.1 and are stuck with No Service, here’s how to fix the problems until Apple releases an updated version. Guys after the update to 8.0.1 for my iPhone 6 no cellular signal and Touch ID..can I revert back to 8.0???? Yes you can downgrade back to iOS 8 using iTunes and iOS 8 IPSW files. An update to resolve these problems will likely be pushed quickly from Apple, this is impacting a lot of users. *Increases the likelihood that users of OSXDaily.com will actually read the release notes of an iOS update. I’m glad some read the release notes, most seem to ignore them! No problems for me updating my 5S over the air. Restarted and Touch ID and cell service both working fine. WTF! Whats going on with Apple? I love their products, have it all. But now lately they are doing big mistakes. manny in a short time period. Also now i don’t know if i should pick up my iPhone plus on friday. Does it bend?? I need to have it in my pocket. Don’t want an android phone when i already got everything else from Apple. I also don’t want the micro screen on my 5s. Im sick of this small screen. I have an iPhone 6 Plus, it’s really great. It’s not bent, though I’m sure if I applied a ton of force to it like the guy in the video did, it would probably bend much like a MacBook Air or other aluminum item would bend from force. I suppose if you had an intention on bending your iPhone or sitting on it then you may not want to get one to avoid the potential of it being bent from force, but I’ve never known anyone who actively tries to damage their phone. Look at this way, if it is an actual problem, Apple will surely recall the phone or offer to fix it for free. I’m certainly not returning mine, I really like the big screen of the iPhone Plus. You bet, enjoy your new iPhone! I think it’s really great, though the larger footprint is a bit of a surprise if you’re coming from a smaller iPhone like the 5 and 5S. It’s perhaps better used with two hands, but the 5.5″ screen is just magnificent. I agree Apple needs to be careful with their quality control, but this update went out to the carriers for them to test and verify it before it was released to the public… what happened to those carrier verifications? In fact, I believe cell service is better after the update. I had many ‘call failed’ problems calling a few different numbers over the past few days, but today have called the same people a few times since the update and not one ‘call failed’. It doesn’t prove anything, but there was definitely a noticeable increase in failed calls when I was briefly on 8.0. Wifi still not fixed in iOS 8.0.1. Be nice if they fixed the Bluetooth issues soon. I tried this but now it doesnt like to work for me. please tell me whats wrong and how to repir.